The name says it all - caramel, honey, toffee and an exotic elixir come home to a new realm of comfort colors. The aesthetic is subtle yet sublime, neutral but never dull. The look supports curves and softness. Our senses are lured not only by the color but also by the feel. Here we taste and experience luxury in the sanctuary of our own homes. 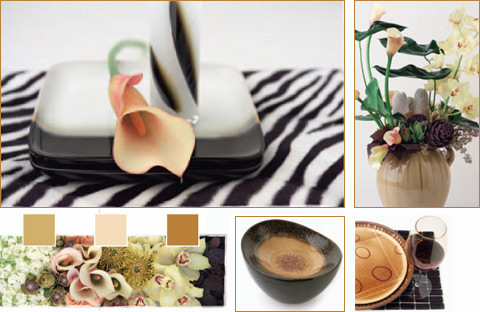 Rich glazes, warm surfaces and amber hues combine to create a modern chic. This style is uncomplicated and comfortable. Wooden vessels, glazed ceramics or amber to brown glassware are appropriate container choices. Cymbidium Orchids and Callas provide soft curves and perfect colors. 'Leandra,' 'Citronella' and 'Limona' roses all fit the color harmony while Leucadendrons, Leucospermums and Banksias all provide the color and a nod to the exotic. The sueded brown backsides of Magnolia foliage finish the look.